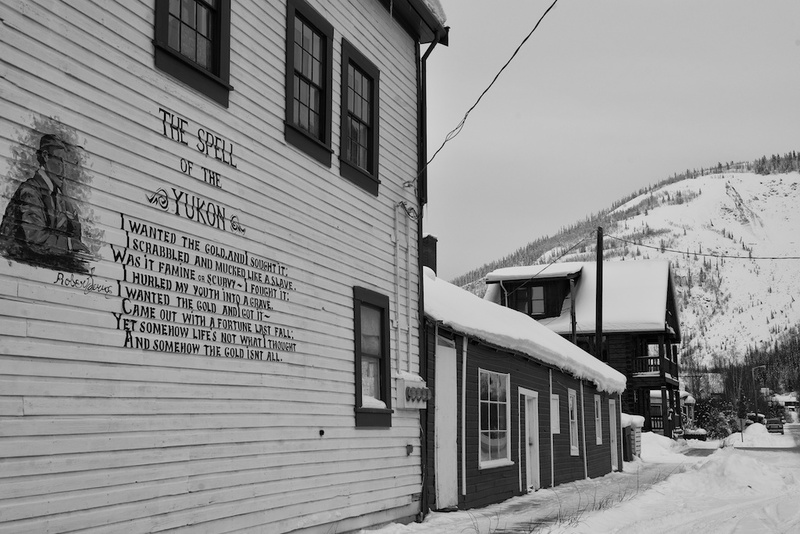 Dawson City, Yukon, is like an itch under your skin. No matter how much you scratch, it’s always there. That’s how Dawson City is for me. I love this whacky, unpaved, raw hole in the wilderness, where the people are real and the frontier mentality is alive and well. When I’m gone for any appreciable time, I think of it and its zany character. Dawson City was built nearly overnight, at the height of the Klondike Gold Rush. During its heyday in 1898, Dawson had more than 40,000 people, every one them somehow involved in the madness of the gold rush. Today the town has perhaps 1,200 residents, although that number climbs somewhat in summer. Today, Dawson is the epicenter of wilderness travel, the launch point for canoeing, kayaking, hiking and touring adventures. It is the provisioning place for those traveling to the western Arctic Circle and beyond. I’m here today for two reasons. First is to cover the Yukon Quest dogsled race, an epic 1,000 mile battle between man and dog and nature. Dawson City is a major stop in that race, a mandatory 36-hour layover for mushers and their dogs. Once all the mushers leave Dawson for their final dash to Fairbanks, Alaska, I’m off with fellow photographer Richard Hartmier to the Arctic Circle, where we hope to rendezvous with the Porcupine Caribou herd for a photo shoot. Back to Dawson. Surrounding the city are the scarred remains of the gold rush, when massive mining machines entered the fray and tore through the earth, heaving tons of soil and rock aside in man’s unquenchable thirst for the gold metal. But the tiny town of Dawson itself is a jewel. First, there are fantastic places to eat, from simple breakfasts to fine dinners (specifics in a later blog). The streets are laid out in a neat grid, with museums and historic building left or restored to their former glory. There is even a wonderful Opera House that serves to this day as an entertainment venue. Dawson was also the first town in Canada to have a gambling hall, and Diamond Tooth Gertie’s Gambling Hall is still operating. Aside from the gambling there is a marvelously entertaining, turn-of-the-century vaudeville show. 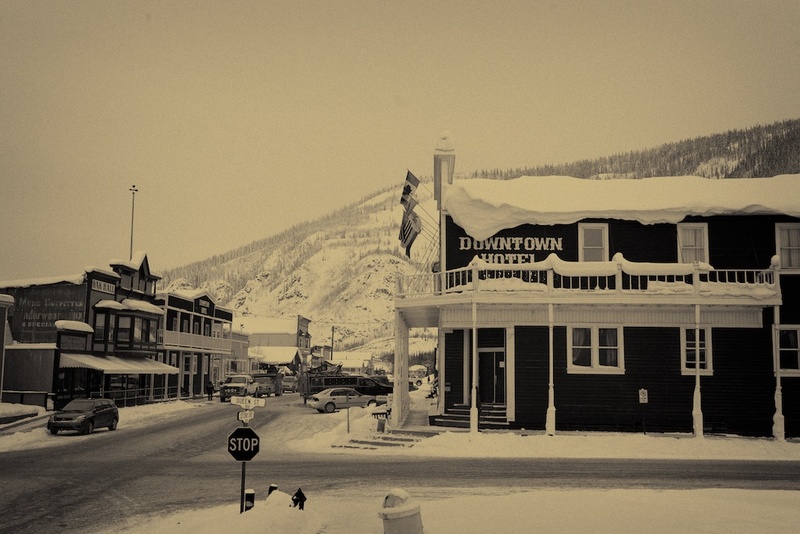 Of course, Dawson is a true frontier town and, as such, has its quirky side, most notably the Sourtoe Cocktail. Served at the historic Downtown Hotel, the drink requires one to… well… okay, there’s no way to sugar-coat this; it requires one to drink a shot of whiskey (or scotch or whatever your poison happens to be) in which a human toe is suspended. The rule is the toe must at least touch your lips, amidst much cheering and profane comments from your fellow inebriated friends. Now, to be sure the toe is biologically clean, stewing as it has been for many, many years in alcohol. But its shriveled, blackened appearance will test the mettle of the stoutest, grizzled Yukoner (let alone photographer originally from Brooklyn, NY). Proudly, I do sport certificate number 31179 (September 20th, 2008), for those you wanting to look up my membership in the rather exclusive Sourtoe Cocktail Club. Robert Service, the great Canadian poet whose Cremation of Sam McGee is a staple in schools throughout North America, lived here in Dawson and his cabin is still preserved, along with Jack London’s cabin, all worthy of tours. You’ll see odes to these great literary figures throughout town. Dawson City Museum (595 Fifth Avenue: www.dawsonmuseum.ca) is a wonderful educational venue for the family. As soon as you enter the museum you are presented with interactive displays explaining the geology of the region. Displays also cover the indigenous aboriginal cultures, as well as exploration by whites, the Klondike Gold Rush and development of Dawson City. There is also a nice gift shop with items on natural history, aboriginal culture, photography books, jewelry and more. Danoja Zho (Long Ago House) Cultural Centre: (http://trondekheritage.com/danoja-zho/) is a small, but critically important museum to understanding the First Nations culture in the region. The Tr’ondëk Hwëch’in culture was dominant in the area until the arrival of white culture and the Centre has displays that show how the native culture interacted with its environment. The Centre also has a wonderful gift shop, offering hand-crafted aboriginal items, clothing, jewelry, music and more. Moosehide Village (http://trondekheritage.com/our-places/trochek/) is a vigorous hike from Dawson City along the banks of the Yukon River. It is a working aboriginal village and if you hike there, please respect the people and their homes. You must have permission to go there and it can be obtained at the reception desk at the Tr’ondëk Hwëch’in Government building. Klondike Institute of Art and Culture (2nd Avenue and Princess Street) offers exhibits of paintings and photographs and also coordinates art shows in Dawson City. 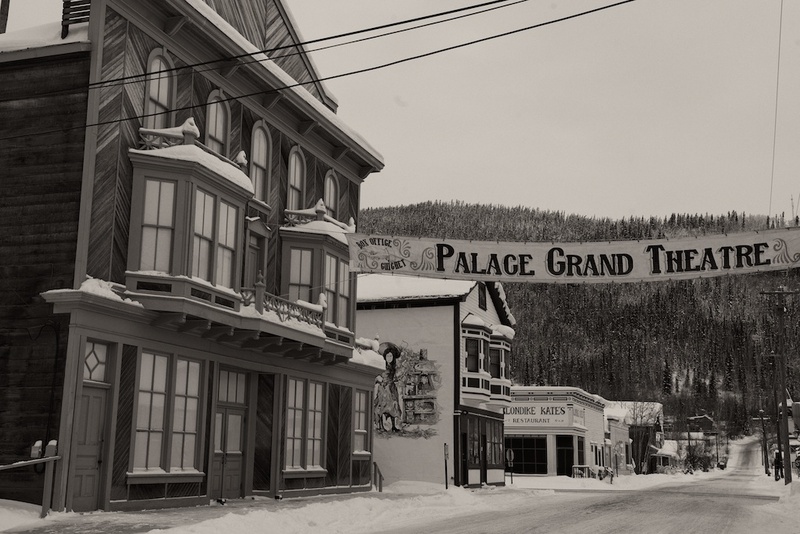 In addition to the above sites, there are numerous historic building located throughout Dawson City. The Park Service maintains a visitor’s information site on Front and King Streets. They also offer walking tours of the city from May to September, using very knowledgeable guides dressed in period costumes. Dredge # 4 on Bonanza Creek, just outside the city, is a national treasure. It is the largest wood hull dredge ever built and the mammoth gold-dredging behemoth is open for guided tours during the tourist season. It’s a fascinating tour and one I recommend for insights into Yukon’s mining history. Jack London Interpretive Museum (8th Avenue and Firth Street: ) offers guided tours explaining the life and times of the famed Yukon writer. Robert Service Cabin (8th Avenue, near the Jack London Museum: http://www.pc.gc.ca/lhn-nhs/yt/klondike/natcul/natcul-dawson/natcul5.aspx). The Dome (formally known as The Midnight Dome) is located just outside the city, about a 5-minute drive from downtown. The road winds up the dome and ends at the summit with a view that encompasses all Dawson and a picturesque part of the Yukon River. Great place for a family picnic and photos of the area. There are several hotels in Dawson, catering to hostelers and the general market. There are no luxury, 5-star accommodations (or even 4-star). I can personally recommend two of them, having stayed for extended times in both. Downtown Hotel (2nd Avenue and Queen Street: www.downtownhotel.ca), home of the infamous Sourtoe Cocktail, is the accommodation most visitors consider the “must-stay” place. It’s historic structure and old-timey ambience will put you into the right frame of mind for turn-of-the-century Dawson City. However, the hotel is old and a bit on the ragged side. There is no elevator, so you’ll have to drag your bags up and down stairs. There is a nice restaurant, the Jack London Grill, in the hotel, particularly for breakfast. Adjoining the hotel is it’s bar, which serves the Sourtoe Cocktail in the evening (see prior blog: https://blog.lesterpickerphoto.com/2011/02/10/dawson-city-or-bust/). The Eldorado Hotel (3rd Avenue and Princess Street: https://blog.lesterpickerphoto.com/2011/02/10/dawson-city-or-bust/) has more modern accommodations than the Downtown Hotel. Once again, a lack of elevators means you’ll have to either lug your bags up or request help from the front desk. An attached restaurant/bar is perfect for casual food. Their nacho platter is huge, dripping with cheese and, paired with a beer, perfect for watching a hockey game. Klondike Kate’s (3rd Avenue and King Street: http://www.klondikekates.ca) has a good reputation for hearty Yukon foods and their popular Tin Roof pie. It can be crowded at peak times. Jack London Grill, located in the Downtown Hotel, serves basic fare. Good for breakfast and lunch, but I’d recommend elsewhere for dinner. Riverwest Bistro (Front and Queen Streets) serves up great coffee, hearty breakfasts and healthy lunch sandwiches. It’s my favorite breakfast and lunch spot in Dawson City during the tourist season. Not open in winter. The Drunken Goat (2nd Avenue and York Street) specializes in mediterranean foods, especially Greek. The portion sizes are generous and the food superb. It’s probably the best dining experience in Dawson. Sourdough Joe’s (Front Street, near Riverwest Bistro) serves incredibly good halibut or salmon fish and chips. If you’re into poutine, a French Canadian dish of french fries with melted cheddar, this is THE place in Dawson to get it. Only open during tourist season. And, remember, dining in the Yukon, especially Dawson City, is very informal.